RIYADH (SPA) — United States special representative for peace in Afghanistan, Zalmay Khalilzad, met with Saudi Crown Prince Mohammed bin Salman bin Abdul Aziz on Wednesday and discussed with him bilateral relations as well as the Afghan reconciliation. Born in Afghanistan, he is a US diplomat and a counsellor at the Center for Strategic and International Studies (CSIS) and the president of Gryphon Partners and Khalilzad Associates, an international business consulting firm, based in Washington, DC. He was the US Ambassador to the United Nations, under President George W. Bush. On September 5, 2018, Khalilzad was appointed by President Donald Trump to serve as a special envoy to Afghanistan. The Crown Prince, who is also Vice President of the Council of Ministers and Minister of Defence, met with US special representative for reconciliation Zalmay Khalilzad in Riyadh on Wednesday, the official Saudi Press Agency, SPA, reported. During the meeting, they reviewed bilateral relations between the two friendly countries as well as efforts exerted on the Afghan arena. The meeting was attended by a number of officials. 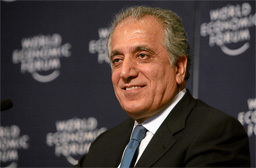 Khalilzad arrived in the kingdom from Pakistan where he and Pakistani authorities agreed to engage Saudi Arabia in pushing forward Afghanistan’s political peace and reconciliation process. Daily Times quoted credible diplomatic sources reported that Saudi Arabia’s inclusion was discussed during Khalilzad’s day long talks with Pakistani authorities on Tuesday at the Foreign Ministry in Islamabad. Pakistani officials made it clear they had no objection to Saudi Arabia’s inclusion in Afghan peace process. A US Embassy spokesman in Islamabad told the Pakistani media that Khalilzad consulted with Pakistani leaders on how best to achieve a durable political settlement in Afghanistan. “Peace in Afghanistan is vital to the long-term stability of Pakistan and the wider region”, Ambassador Zalmay Khalilzad was quoted as saying by US embassy spokesman in Islamabad. Meanwhile, some 150 US soldiers will deploy to Afghanistan from Fort Knox in Kentucky at the end of the current month. The engineer soldiers will conduct route clearance operations in Afghanistan. The Federal Bureau of Intelligence (FBI) told lawmakers on Wednesday, that Al-Qaeda, even as its capabilities have significantly diminished, continues to pose a threat to the United States.